You can always tell a lot about a person by looking through their dresser or closet. You probably don’t get that opportunity very often, but if you did you’d probably gather a lot of style intel real quick. What would people think about you if they raided your wardrobe? Getting creative with fashion is one of the best ways to show who you are and express those fun parts of your personality. I personally love adding really unique, rare finds to my wardrobe. Whether it’s vintage, or a thrift store find, I love mixing in those fun pieces to express that side of myself. Some of my personal favorite things to wear are things I’ve made, or added my own flair to. So, on that note- I wanted to show you a really fun, easy way to add some character to your own wardrobe with a distressed t-shirt! 1. Choose a Shirt – Go through your closet or visit your local thrift store and choose a slightly oversized t-shirt with a material, color, and graphic you like. I like finding shirts that already have a worn out look to them. It really adds to the “grunge-ey” style. 2. Determine Your Cut Style – As you’ll see, for this demo I chose a “cut-out” style that leaves the collar portion of the shirt intact. If that’s not really you’re look, you can always opt for a style that creates a larger scoop neck without the collar attached. I don’t use any pencil marks or guides when I cut my shirts, because I want any imperfections to add to the look, but if precision is more your thing, I definitely encourage you to mark your shirt up with cut lines and guides to help you! 3. Snip Snip – Take a deep breath, and let’s get to cuttin’ – This part is always a little more nerve wracking the first time you do it because you’re feeling pressured to not mess up. But, think Bob Ross while you cut- “no mistakes, just happy accidents!” That may be the most helpful advice, or the least helpful. So, sorry if it’s the latter for you! Haha. 4: Distress – Ok, this is by far the most fun part. I love distressing. It’s so fun to make things look old and worn, especially clothes. For this part, you’re going to need your scissors, cutting board, and a sanding block or piece of sandpaper. It’s important to keep in mind during the distressing process to not be heavy-handed. You don’t want to create giant holes, you’re mostly trying to create slight rips or more of a shredded look. To start distressing, make sure you place the cutting board inside the shirt, so it doesn’t cut through to the backside of the shirt. Once you do that, open your scissors and use one blade in a swiping motion back and forth on the material. You’ll start to notice little slice marks. Before you slice all the way through, use your sanding block to sand that sliced area to create a nice grunge texture. It’ll take a little getting used to, but once you master that little process, you won’t want to stop! Keep repeating that process on other areas of the shirt that you’d like to look worn! 5. Style It! 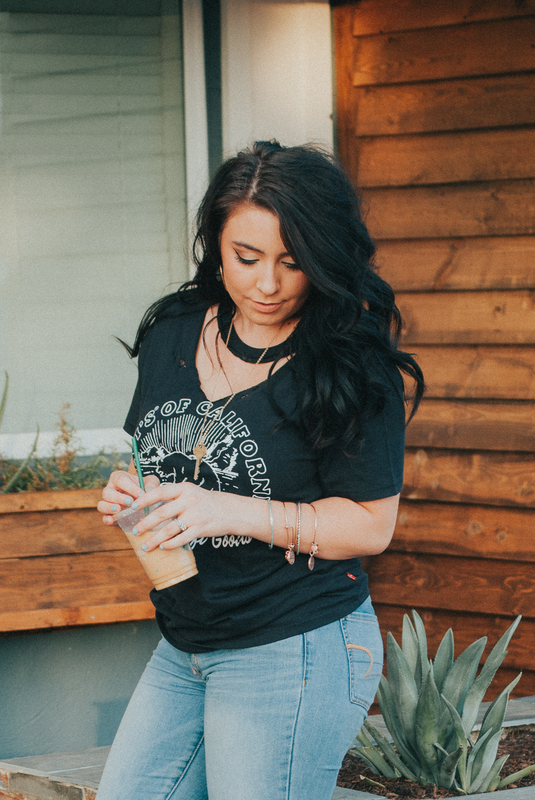 – Whether it’s sandals, combat boots, a leather jacket or even a denim skirt, get creative with how you style your newly distressed piece. I promise, you’re going to want to give all your shirts a makeover after you master the distressing process! I love the fun flair and interest it adds to any outfit! 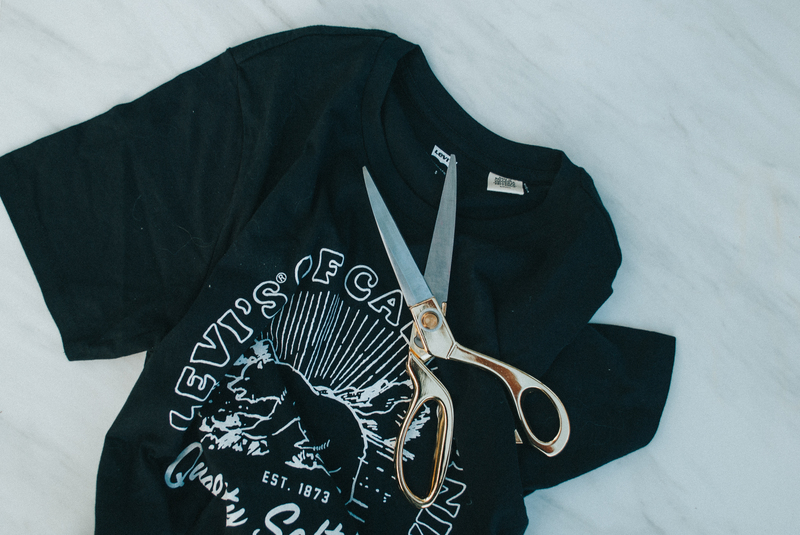 If you’re feeling inspired to create your own DIY Edgy Tee, don’t forget to show us! We’d love to see your unique creation! Article and images by Daryn Mae. 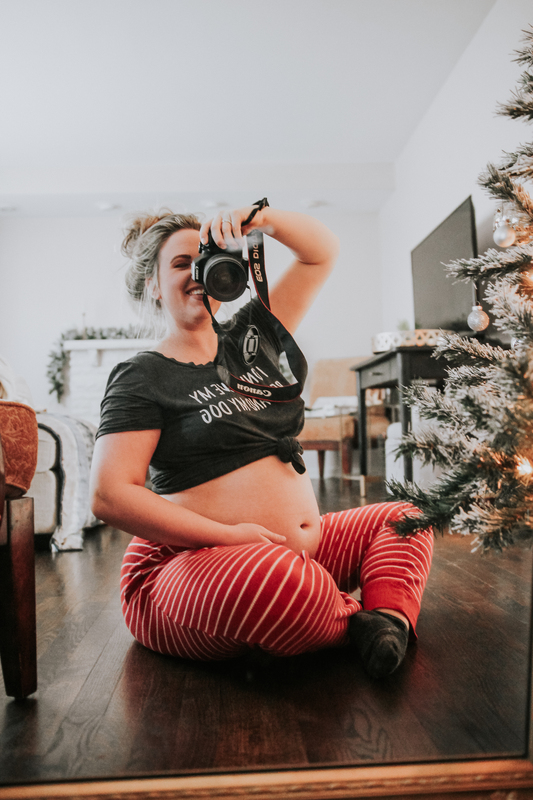 You can view more content by Daryn on her blog darynmae.com and on her Instagram here. Hey There! I’m Daryn Mae. I’m a blogger, graphic designer, artist, and interior stylist. I’m an Arizona baby, born and raised. I live here with my sweet husband, and our two fluffy golden babies. I love wine tasting, coffee tasting, and pretty much anything that involves food. I’m a sucker for the simple pleasures in life and really savoring the small moments. I’m obsessed with thrifting, antique shopping, my family and big hair.